Like the film 2001: A Space Odyssey illustrated how the evolution arc from ape to man required improved tools, we are ushering in a New Age with our Hybrid Number Plates. Things never stay the same, as is currently being demonstrated by the fact that grey is now the UK’s favourite car colour. Speaking of change, we have improved and developed an exciting number plate solution that’s hot on the market. 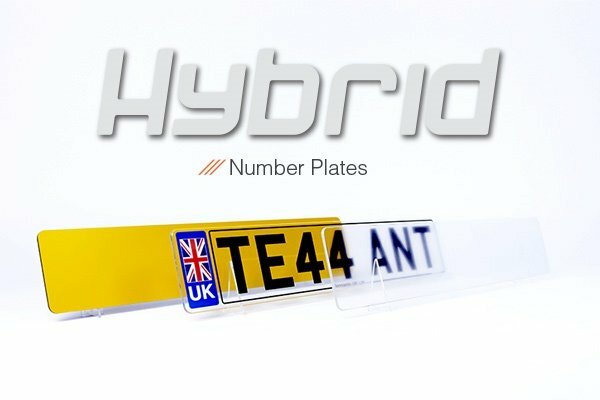 Our technical team have combined film, reflective and acrylic technology to produce a Hybrid Number Plate. This evolution brings all the best features of the three popular components that we stock. We’ve discovered that 75% of our customers prefer the look and finish of reflective and acrylic number plates but also require rich coloured badges, borders and corporate branding. By combining all the best elements together, you can now create the smartest looking number plate in the U.K. whilst remaining fully compliant to BSAU145d. Our Trade Series features LED printers that allow our customers to embrace this new age and upgrade their plates to stand out from the crowd. If you would prefer to have number plates made in house, we can also arrange this. Our production facilities are capable of designing, printing, building and shipping a whole range of number plates on next day availability.